Car 1 on the second half of the Semi-Marathon. Car 2 climbs up one position in overall accumulated rankings to 8th. 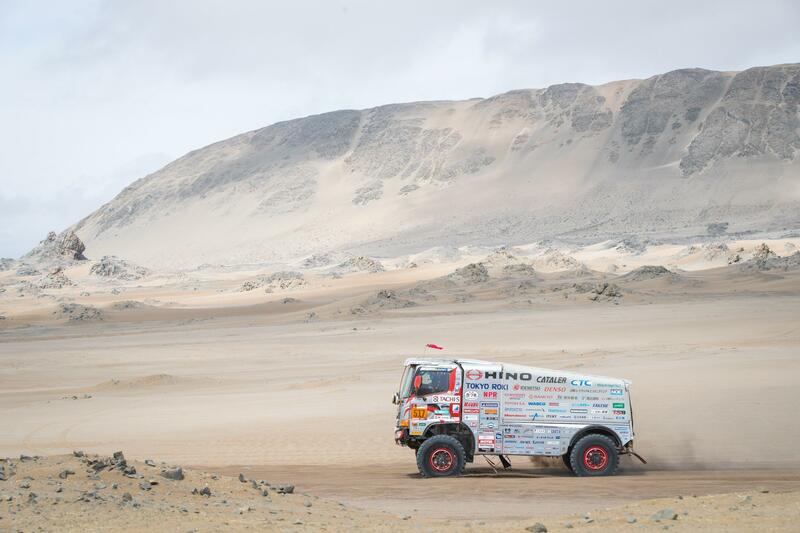 Tuesday, Jan 15: Contestants raced a 359 km SS (Special Stage) on their way from San Juan de Marcona to Pisco. This area was one of the main battlegrounds of this year's event where the organizers cleverly avoided any overlaps despite this being the third time racers ventured into the area. The second half of the day met contestants with a particularly difficult dune stage. HINO TEAM SUGAWARA's Car 2 crewed by the Teruhito Sugawara and Katsumi Hamura duo was the 9th truck out of the gate for the day's SS. The crew completed the high-speed off-piste (roadless off-road segment) without a hitch, arriving at 8th spot at the neutral zone set midway into the stage. 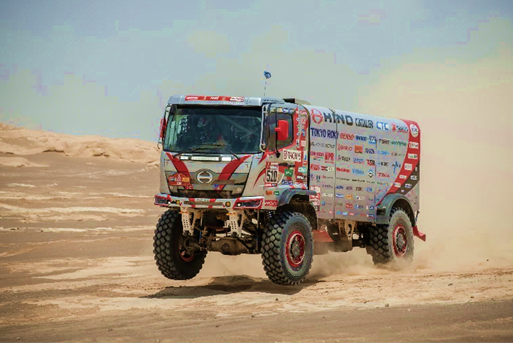 While they continued to deliver a solid race over the dunes in the latter half, they were stuck with all four wheels in the air past the 200 km point following a difficult climb. It took the crew 40 precious minutes to extricate themselves from this jam and they had fallen to 12th spot by the time they passed the CP (checkpoint) which came soon after. 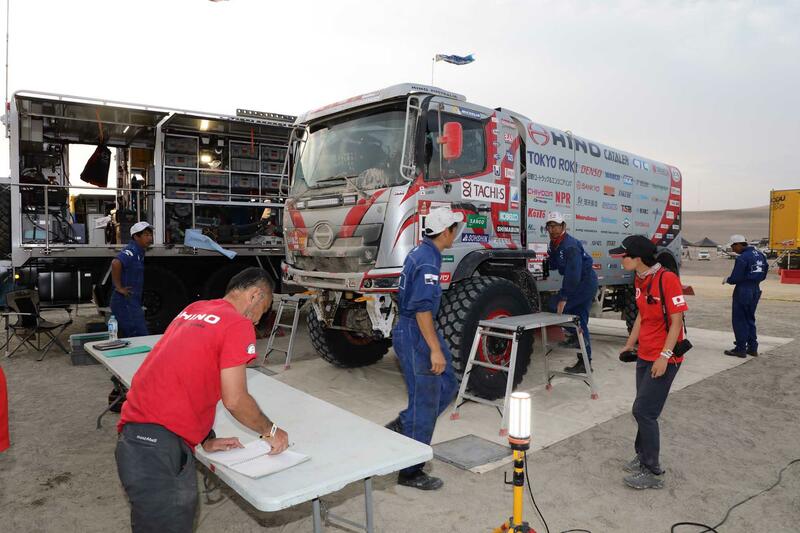 Still, the HINO500 Series truck Car 2 crew made up with fierce driving to finish the SS at 10th position. This brought their overall accumulated ranking to 8th place, wedging their way into the ranks of their larger rivals. 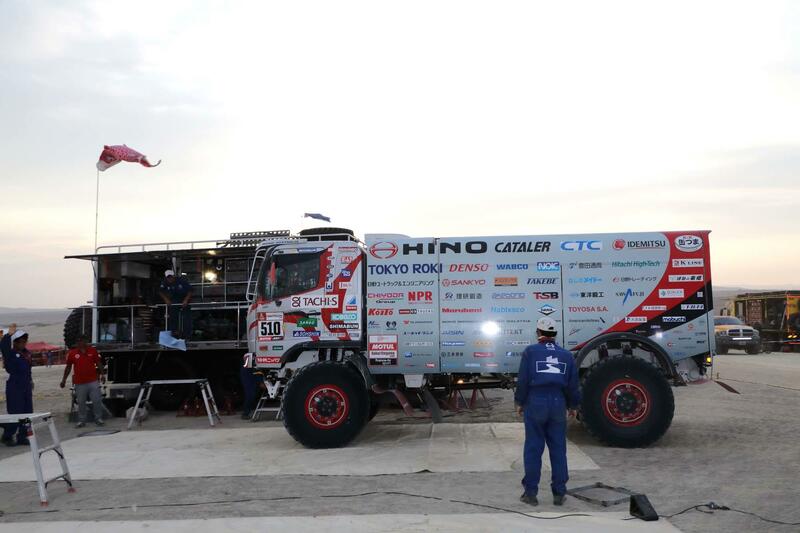 Meanwhile, the Yoshimasa Sugawara and Ahito Sakurai crew on HINO500 Series truck Car 1 raced the Semi-Marathon, a classification for racers who had to withdraw from the race in the early stages. They were back at the bivouac in Marcona near midnight Monday, Jan 14, and wasted no time to start off for the Tuesday, Jan 15 competition. After passing the 200 km point at around 6 pm, they are reportedly still on the road at 10:00 pm as of this writing. Tomorrow, Wednesday Jan 16, contestants will be racing a loop course based out of Pisco for what will essentially be their last day of racing. Visibility was quite bad from the morning fog right after the start. The Pisco dunes were easier to drive on compared to the ones in Marcona. Getting stuck was frustrating, but it didn't to seem to have an affect our position. We lost one plate (used as a slip stopper for tires during extrication) where we got stuck. Navigation largely involved following the waypoints (GPS points that racers are required to pass) so there was little risk of making course errors. We will stay on our toes and give it our best for one more day. Mechanics meet Car 2 back at the bivouac. Teruhito Sugawara climbs down from his cabin at the Pisco bivouac. 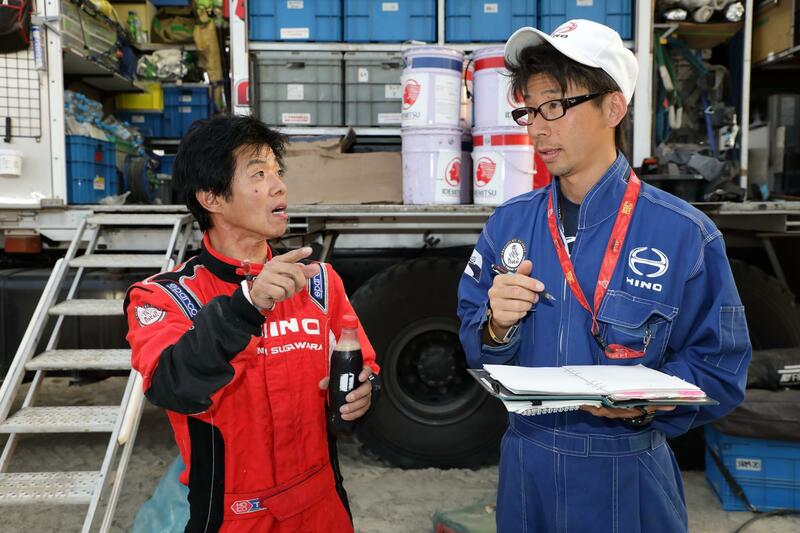 Navigator Katsumi Hamura discusses servicing details for Car 2. Mechanics get ready to service the truck.